Decorating puts the D in D.I.Y. Are you inspired to refresh or redesign a room? You may have just moved in or feel the urge to change the whole colour scheme, layout, fixtures or fittings. You may have been staring at the same wallpaper for 20 years. The alterations and decorations that can be done to a home is endless and jobs will always take DOUBLE the time you thought. Accept that you will live off gloss fumes and blind enthusiasm. That said, you’re allowed to take shortcuts. With a bit of creativity and elbow grease you can transform a room on a budget. We recently decorated our living room and as a first time DIY’er made a few rookie mistakes. Wash down and prime walls with sugar soap prior to decorating. Alternatively just use plain old washing up liquid. Hoover and dust rooms beforehand, otherwise you will end up with dirt and pet hair in your paint tin. Woof. Make sure a room is well ventilated. If you are working up high be sure that A-frame ladders are always locked in the open position, and that they’re placed on a stable, level surface. Where needed use safety goggles, gloves and a dust mask. Tape a piece of paper under where you are drilling to catch the dust. Fill a room with plants, hardy ones like succulents and cacti or invest in some fake ones if you have kids or pets. Plants bring natural beauty to our living spaces. Painting walls and ceilings should be fairly straightforward and a new coat of colour is the most cost effective way to update your homes decor. You do not have to be a DIY master. Be sure on your shade, you can test out colours on a room before purchasing here and figure out how much you need using this tool. Pick a durable paint with added acrylic for high traffic areas. I picked the perfect shade of grey for a feature wall. Grey was the perfect choice for a feature wall for our South facing lounge and offers on trend neutral backdrop whilst injecting character into a room. Half painted walls give the illusion of higher ceilings. If you are looking for pops of colour but have limited resources (and patience) paint the edges of doors or sides of drawer. Be Bold. The eyes of the room. Add trim to your windows. Moulding will just about upscale anything and framing your windows is one of the most effective ways to boost your homes décor. Hand curtains high and wide to create the illusion of space. Use masking tape for clean lines rather than pads and cutting in brushes. Remove before it is completely dry. Use Vaseline as a barrier on nails and picture hooks. 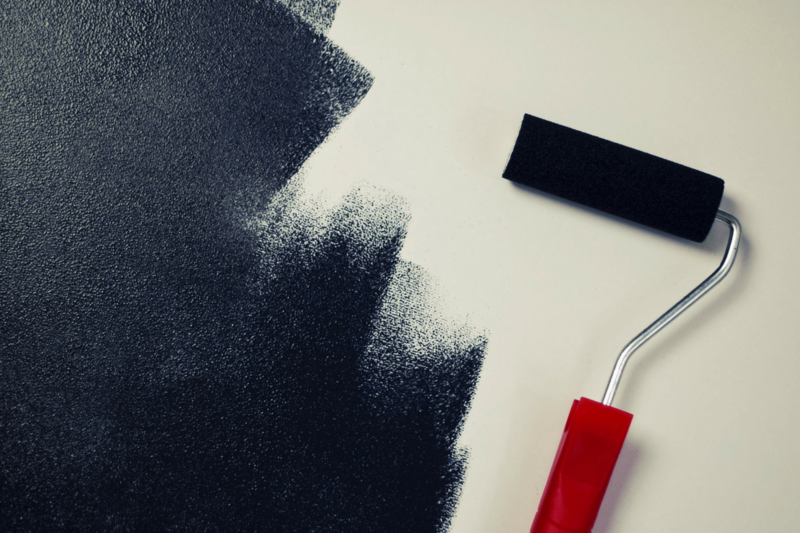 Before you close a tin of paint, give it a quick clean around the edge of the lid can with a cloth – this will stop bits of dried paint falling into the fresh paint when you open it next. Have baby wipes nearby for spills and cover the floor in an old sheet or newspaper. Don’t paint at night, you will wake up the next morning to a patchy wall. Wrap rollers and brushes in cling film in-between coats of paints to stop them drying out. You can also put a layer under the paint so when it is dried and finished with you don’t need to spend hours scrubbing the tray. Don’t skimp on your paint or your tools. For the love of Pete buy one coat paint and the right type for your wall. Buy magic white paint if you struggle to tell where you have been rolling with white ceilings. Brushes that don’t lose their fibres and large, long handled rollers that can be suitable for high up. Whatever size roller you choose buy a large tray. Lighting makes or breaks a room. Professionals build layers of lighting to create interest, intrigue and variety. In a room where everything is lit evenly, nothing stands out. Lamps add ambience and a welcoming softness to a room. Wires can be hid in shower curtain rods, under rugs, or turn it into wall art! In this room the fireplace and the lighting work together as a collective focal point, bringing your eye right to the center of the composition and anchoring it there. Resit overcrowding a room with furniture. Pick mismatched pieces rather than a theme or sticking to one design or type of wood. For example, a nautical look is popular, blue and white nautical palette, some sailboat paintings can lack individuality. It’s not all about practicalities, think of the bigger picture, you have invested time and money into a room, make sure you have home insurance from http://www.chill.ie/home-insurance to protect your cushions! Do you have any decorating tips? Or had any DIY disasters? Would you rather pay a handyman to do it?